We have a great listing for the new items that Kershaw Knives will be offering for 2010. Boker of Solingen Germany offers this great new folding knife. This Boker offering is a beauty. It is a heavy and well built folder with some unique features. There is a safety that prevents the opening or closing of the knife. The large, flat grind is highly polished giving a really nice look. The skeletonized handle features cut-outs that are also attractive in their design. Overall, it’s a sturdy, well made folder with exceptional blade steel. You can see these knives at www.knifecenter.com. Reporting from the 2010 Shooting Hunting and Outdoor Trade show in Las Vegas. The overall themes of this SHOT show included a general tendency towards thick blades, the increased use of the Besh Wedge style of blades, the reissue of old models that had been retired and many hawk bill blade models. 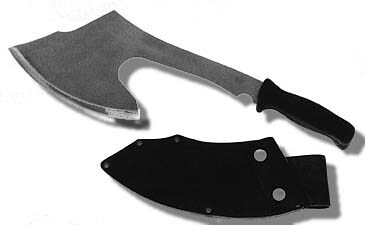 We have a listing of the new items that Columbia River Knife and Tool will release throughout 2010. We don’t have delivery dates, but these are available for preorder. You will not be charged, of course, until the items ship to you. BokerPlus is Boker’s production from China and Taiwan. The designs are all Boker and the quality is very good. The pricing is all China and this is a great combination. This Boker Plus folding combat knife is a beefy, tough knife with a lot of features. It really is more of a Kalashnikov than the earlier models. The handle looks and feels like a pistol handle. The grip is great. The blade is beefy, too. Spyderco Knives is one of our favorite companies. The Spyderco Military is a great series of combat folding knives. We have several models available. This new one, however, is really something. It is basically a combat Sebenza! Made in the USA by Spyderco Knives, it is made with the same materials found on a Chris Reeve Sebenza and Spyderco even calls their frame lock mechanism, the “Reeve Integral Lock.” The handles are Titanium. The blade is top quality S30V stainless. The shape and quality is Spyderco all the way. Just in- the 2010 catalogs from Benchmade! We don’t have extras, but I can tell you some of the items in them. There’s a new Bob Lum designed folding knife the Onslaught- with an Axis-Assisted mechanism and a blade over 4″. It is beautifully designed- as all Lums have been, with a unique blade shape. They are also offering a tough framelock (monolock) called the MPR with a g10 side and a titanium side and a titanium clip- It’s 3.4″ M390 steel blade is stout. Designed by Shane Sibert, this is a very cool, combat folder although not cheap. Then there is the new Tomahawk. There’s more new stuff that we will add as we can- including a pen with a carbide tip- for smashing windows, a new HOOK safety cutter with a strong enough and wide enough hook to cut leather and up to 1/2″ of rope, there’s an Auto Axis named the bedlam with a upswept blade, a mini Infidel, , a Lerch auto with mostly steel handle called the Impel, a Rift with auto Axis, new water knives with N680 steel- one folder with wide drop point blade and a fixed blunt tip with gut- net hook. 2010 promises to be the best one yet. We have a great crew at the KnifeCenter and great products to offer you. We hope to have a brand new web site up within months that will have features far beyond anything you have seen – at least in our industry. Everyone is hoping the world’s economy picks up and the manufacturers keep doing well so that they can offer more new products. It’s a great time to be a part of ecommerce and the cutlery and housewares industries. Best wishes to all our wonderful customers and may all your dreams come true!